Yesterday in southern Ontario a train derailed killing three engineers and injuring many other passengers. It was a sad day, which also happened to be the day after I watched this Tony Scott action movie on Netflix, as I happened to miss it last year. The train has been such an important part of our economy and culture for a couple of centuries, and it has also been a frequent setting for cinema. There’s something cinematic about the power of a train, from those first Edison films to John Ford's breakout film The Iron Horse to Hitchcock’s use of the metallic beast as a metaphor for his characters' isolation and confinement (and in the case of North By Northwest, the consumation of his characters’ sexual tension). 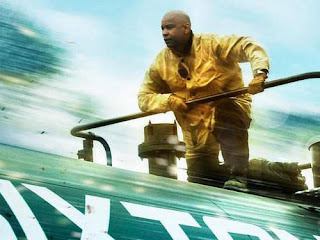 In Unstoppable action veteran Tony Scott finds an interesting film in a real story of a train carrying flammable diesel fuel running wild out of its depot on a crash course with a small Pennsylvania town. The accident happens when a lazy and portly train engineer (Suplee) gets out of the train to switch tracks while it's moving. Unfortunately, when the throttle level moves on its own, it accelerates the train, leaving the ol’ fatty gasping for air. Enter Denzel Washington and Chris Pine, an old cynical veteran paired with a wet-behind-the-ears engineer. They’re off on their own journey, business as usual, but bickering about union gripes and various other working class burdens. Suddenly, on this random day both men get thrust into this adventure with a chance to save lives and reclaim their confidence and pride in their jobs. This is disaster filmmaking 101, where the threat of an inanimate object on people’s lives serves as the chief antagonist, and the screenwriters plug into interpersonal conflict as a proxy for a non-existent human enemy. In this case it’s Kevin Dunn playing the white collar, suit-wearing lackie who wants to derail the train on purpose to avoid disaster. But Scott and company aren’t content to characterize Dunn in standard black and white terms. He’s clear to show Dunn as a former rail yard workman instead of an ignorant desk jockey. His end goal is the same as our heroes, but they have a differing opinion on which plan will work. For our working class heroes, they desire to use their own train engine to catch up to the half-mile-long wild train, hook onto its back like a caboose and slow it down enough for it to successfully navigate past a dangerous dogleg turn. Scott successfully cuts back and forth between Washington and Pine, the men and women relaying instructions from the dispatch centre, and a whole lot of helicopter shots, crash zooms and quick cuts of the run-amuck train zooming past the camera. We don’t get too many of these disaster pictures anymore. In the '90s we regularly got one or two every season, thus over-saturating the genre. And so, in moderation, a film like Unstoppable can successfully stimulate us. After watching the film I just had to look up the ‘real story’. According to the news clip I found on youtube, the film could barely warrant the use of the term ‘inspired by’. There were very few, if any, lives threatened in the real story, but there were just enough for Hollywood to turn it into money making entertainment.